Wildcamp on Great Gable 19th May 2011, I thought Its about time I posted this blog because of mounting pressure by fans lol, me and Chris met up at Seathwaite farm at 12.30pm I was five mins early Chris was about 20 mins late haha. We set off hiking the Sour Milk Gill Route which is approx 2.5 miles to the summit which passes the beautiful sight of a waterfall. During this time we had clear skies very little cloud great visability and there was mention of a dark cloud in the distance then in a very short time we were covered in fog and the winds had increased and that was the end of any plans of a sunset. I regret not having any 360 degrees footage from the top just above us not having a photo of the three of us or even a photo of myself at the trig point, I am still amazed at how swift we lost visability my plan was to get my suppa over and take some more snaps. Above left showing the route from Seathwaite campsite, above right the Wildcamp Spot. Great Gable from Wasdale. The cliff at centre is the Napes of Great Gable. Great Gable is a mountain lying at the very heart of the English Lake District, appearing as a pyramid from Wasdale (hence its name), but as a dome from most other directions. It is one of the most popular of the Lakeland fells, and there are many different routes to the summit. Great Gable is linked by the high pass of Windy Gap to its smaller sister hill, Green Gable, and by the lower pass of Beck Head to its western neighbour, Kirk Fell. 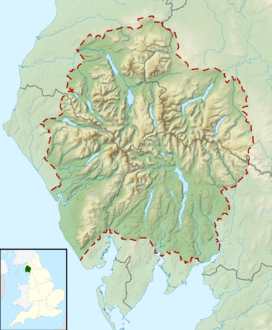 The Western Fells occupy a triangular sector of the Lake District, bordered by the River Cocker to the north east and Wasdale to the south east. Westwards the hills diminish toward the coastal plain of Cumberland. At the central hub of the high country are Great Gable and its satellites, while two principal ridges fan out on either flank of Ennerdale, the western fells in effect being a great horseshoe around this long wild valley. Great Gable and its lesser companion Green Gable stand at the head of Ennerdale, with the walkers' pass of Sty Head to their backs. This connects Borrowdale to Wasdale, giving Gable a footing in both valleys. The Borrowdale connection is quite tenuous, but Great Gable is "the undisputed overlord" of Wasdale in that it is paramount in almost any view up the lake. Once seen, the naming of the fell Great Gable requires no explanation. The upper section of Great Gable has a roughly square plan, about half a mile on each side, with the faces running in line with the four points of the compass. The fells connecting and subsidiary ridges occupy the corners of the square. The northern face is formed by Gable Crag, prominent in views from Haystacks and the surrounding fells. This is the longest continuous wall of crag on the fell and reaches up almost to the summit. Scree slopes fall away below to the headwaters of the River Liza, beginning their long journey down Ennerdale. There are few crags on the eastern slopes, although these fall steeply to Styhead Tarn, a feeder of the Borrowdale system. About 30 ft deep this tarn occupies a scooped hollow, dammed by boulders falling from the slopes above. It is reputed to contain trout and is a popular location for wild camping. The southern flank of Great Gable falls 2,300 ft direct to Lingmell Beck, one of the main feeders of Wastwater. Right below the summit are the Westmorland Crags, and then a second tier breaks out lower down. These are Kern Knotts, Raven Crag and Great Napes, all footed by great tongues of scree. Finally on the west rough slopes fall below the rocks of White Napes to the narrow valley of Gable Beck, a tributary of Lingmell Beck. From the north western corner of the pyramid the connecting ridge to Kirk Fell runs out across the col of Beck Head (2,050 ft). There is a small tarn in the depression, and sometimes a second after heavy rain. Both are blind, having no apparent inlet or ouflow. Gable Beck runs south from Beck Head, while an unnamed tributary of the Liza flows northward. The main spine of the Western Fells continues along the north east ridge to Green Gable, dropping to Windy Gap (2,460 ft) as it rounds the end of Gable Crag. This ridge is rough and rocky, further worn by the boots of countless walkers. Stone Cove lies on the Ennerdale side while the rough gully of Aaron Slack runs down toward Styhead Tarn. The south eastern ridge provides the connection to the Southern Fells, across the pass of Sty Head. This is a major crossroads for walkers and climbers, the summit being at around 1,560 ft. On the opposite slope is Great End in the Scafells. Kern Knotts lies on this south east ridge, as does the small pool of Dry Tarn. The south western ridge gives to high level connection, dropping down Gavel Neese in the angle between Lingmell Beck and Gable Beck. Lying on the edge of the Scafell Syncline, the various strata dip to the east. The summit area is formed from a dacite lava flow (Scafell Dacite), directly underlain by the Lingmell Formation. This tuff, lapilli tuff and breccia outcrops a little to the west of the summit. Around Beck Head is evidence of the Crinkle Member, welded rhyolitic tuff and lapilli-tuff with some breccia. A dyke of andesite and hybridised andesite porphyry is responsible for Kern Knotts. Wast Water seen from the summit of Great Gable, 4.5 km to the NE. The summit of Great Gable is strewn with boulders and the highest point marked by a rock outcrop set with a cairn. There is a plaque set on the summit rock commemorating those members of the Fell and Rock Climbing Club who died in the First World War; an annual memorial service is held here on Remembrance Sunday. The club bought a large area of land including Great Gable and donated it to the National Trust in memory of these members, and the plaque was dedicated in 1924 by Geoffrey Winthrop Young in front of 500 people. Due to its central position within the Lake District and great prominence the summit has some of the best panoramic views of any peak in the area. All of the main fell groups are laid out, serried ranks of hills filling the skyline, although surprisingly Wast Water and Windermere are the only lakes visible. A hundred yards to the south west of the summit, overlooking the Napes, is the Westmorland Cairn. This cairn was erected in 1876 by two brothers named Westmorland to mark what they considered to be the finest view in the Lake District. From here ground falls away into the profound abyss of upper Wasdale. Further cairns mark the top of Gable Crag. It is testament to the high regard that many walkers have for Great Gable that the summit has become a popular site for the scattering of ashes following cremation. Routes to climb to the summit start from all of the main dales that radiate out from central Lakeland. From Wasdale the south west ridge up Gavel Neese provides the obvious, and consequently steep and rough, line to take. This can be finished either via Little Hell Gate, a well named and atrocious scree gully, or more sedately via Beck Head. The walk up Ennerdale is long, unless staying at Black Sail Youth Hostel and again Beck Head gives access to the summit area. Ascents from Borrowdale or Wasdale can also make use of Sty Head pass, before slogging up the south east ridge, or the scree filled Aaron Slack. Finally Gatesgarth (near Buttermere), or the summit of the Honister Pass road can be used as starting points, crossing the high hinterland of Grey Knotts and Brandreth to arrive at Windy Gap or Beck Head. Among indirect ascents, a popular alternative is to climb Sour Milk Gill from Seathwaite in Borrowdale, first ascending Green Gable before traversing Windy Gap. fellside from there to provide access to Wasdale markets for his illicit whisky. Aaron Slack by contrast does anything but contour the fellside, but provides a fast way down from Windy Gap to Sty Head. Great Gable has cliffs to the north (Gable Crag) and south (Westmorland Crags, the Napes, and Kern Knotts). The Napes are important in the history of English rock climbing: W. P. Haskett Smith's ascent of the remarkable detached pinnacle of Napes Needle in June 1886 (now graded Hard Severe) is thought by many to mark the origins in England of rock climbing as a sport in its own right, as opposed to a necessary evil undergone by mountaineers on their way to the summit. Those wishing to climb Napes Needle should be warned that a safe descent is far more difficult than the ascent as there are no permanent anchors or bolts to abseil from. Down-climbing is the only way to get from the summit to the shoulder and gear on this second pitch sparse to say the least. A relatively simple abseil can be set up to get down from the shoulder. ^ Connor, J (23 October 2007). "Poppycock". North West Evening Mail. http://beta.nwemail.co.uk/news/1.156053. Retrieved 2009-03-24. W. P. Haskett Smith's account of the first ascent of Napes Needle from the FRCC Journal, No. 8, 1914. Powered by WordPress v 4.7.13. Page in 0.778 seconds.